Technology designed to keep families connected can be complicated for young children to use. A new connected speaker that goes right on the refrigerator door, the Triby from Invoxia, makes family communication easier for kids and parents alike. Keep in touch when the kids are at home but you're not by calling them up for free from your smartphone through the Triby. 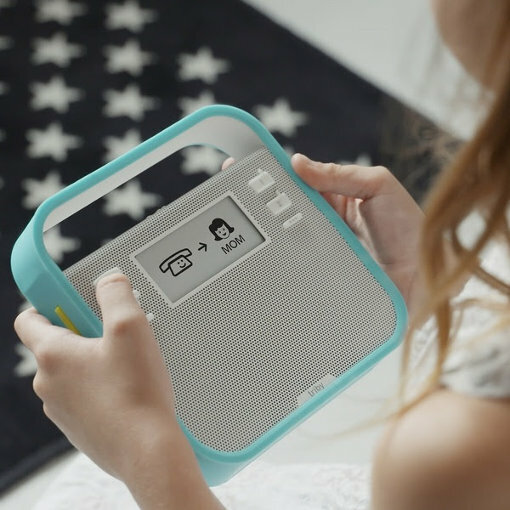 Your kids can use the Triby to call your smartphone or other important numbers that you set up. The Triby facilitates subscription-free, high-definition calls via Wi-Fi to your Internet router. Want to send a note instead? Send a post-it. Make your post-it doodle on your phone and send it to the Triby. A yellow flag on the left side of the Triby pops out to notify kids that a note has arrived. They can view the note on the Triby’s 2.9-inch, high-resolution e-paper screen. Since the kitchen is one of the main places in the home where the family members gather, Triby was originally designed to go on the refrigerator door. But if you don’t want to stick it to the fridge, it's completely portable and easy to take elsewhere. The kids can take it wherever they are in the house to listen to Spotify and keep in touch with parents while they're at it. In Vivo Acoustic technology gives the Triby powerful bass and clear highs. Such superior audio quality is great for enjoying the integrated Spotify Connect, letting you stream music and Internet radio broadcasts over your Wi-Fi connection. You can even listen to music even with your phone turned off. The Triby can also function as a hands-free Bluetooth loudspeaker for your mobile phone. Just press one key on the Triby to take an incoming call. Since the device uses a high-quality speaker system, hands-free calls are clear and crisp. Whether it’s your partner’s voice or streamed music on the speaker, you can hear the audio up to about 15 feet or 5 meters away. The Triby has a long-lasting Li-ion rechargeable battery that lasts up to one month with average use. Purchase the Triby ($199 on Amazon) and replaceable bumpers ($19 each in blue, red or green) from Amazon.